Do you have a band-aid in your fast-aid kit box? I am sure, you have or if not you would probably refill it soon as it is one of the quickest solutions to apply in small cuts and bruises. Lightweight and flexible, the patch seems to bother us less than we would otherwise face and helps us cover the wounds from dusts and other foreign particles. One of the main features from its specification book probably highlights its easy use and throw characteristic. Owing to which, we can now move on to a generation where band-aids or similar-looking patching can do a lot more than just to protect us from petty injuries. A group of scientists from the Binghamton University in collaboration with the State University of New York has aided a research project involving a paper-based sensor that permits diabetics to measure the glucose content during exercise. The contemporary set ups for glucose self-testing calculates the glucose level in blood. However the methods are not equipped enough to stop hypoglycemia during exercise, states Professor Seokheun Choi, Electrical and Computer Science Assistant Professor at Binghamton University. What reasons does Professor have to make such a conclusion? According to him, the process is inconvenient. The existing systems are invasive and take blood samples for testing which keeps open the room for contamination and skin irritation with sweat containing electrolytes and proteins. Moreover, the method is not self-sufficient and compels one to carry lancets, alcohol swabs and a comparatively large glucometer. Also, the available technology seeks the support of electrochemical sensing technique and electrical energy which fails it from being a portable and futuristic solution. The team comes with an aid that promises to fill the gaps made by the conventional instruments. 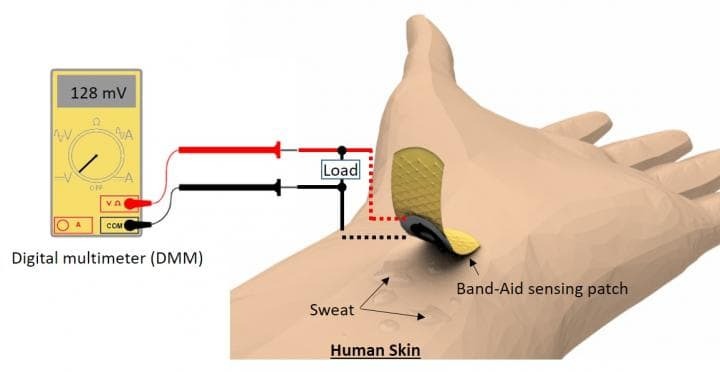 Choi’s research team has developed and prototyped a self-powered, wearable and disposable paper-based patch just like a regular band-aid that offers a non-invasive glucose measurement from human sweat. The one-time-use-only sensor based patch incorporates a vertically oriented paper-based glucose/oxygen enzymatic fuel cell into a paper-based adhesive patch. Harbinger of a new generation of medical equipment, the research holds a lot of potentials to be the next big thing in medical technology. The research has been published in the Micromachines journal. Great effort to make the things bit more ergonomic and easy to use. Need to wait and see the fully functional band aid glucose monitor for better understanding but i dont like the idea of single use and throw in any inventions. We want to put effort to make more durable and reusable products to make less waste. Its a cycle and any inventions must go an a full predictive approach of disposal of the product once it was used as most of them involves chemicals that may form hazardous waste if react with environmental factors.